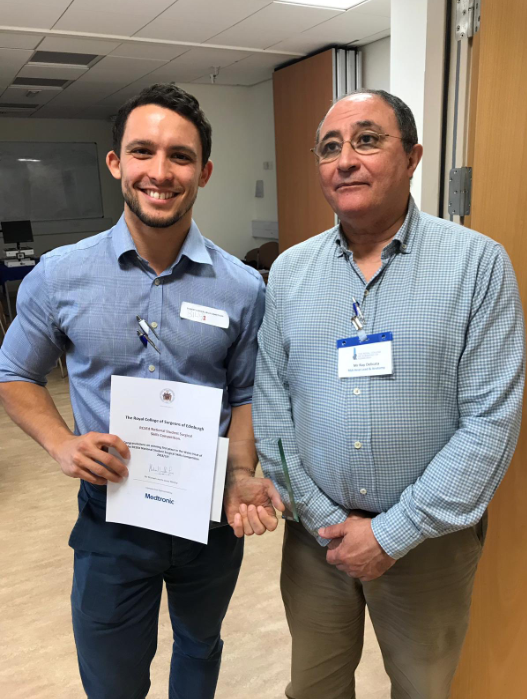 Senior Medical Student announced as Wales Region heat winner of nationwide Surgical Skills Competition. With only 8% of medical undergraduates qualifying as surgeons in one of the ten specialities, surgery is an incredibly competitive area, so being able to demonstrate the commitment and the skills to become a surgeon at this early stage puts students at a great advantage later in their career. The ground-breaking competition, now in its fourth year, sees final year medical students from across the UK demonstrate their surgical talents and skills in a series of challenges. The competition begins with 19 heats, one at each UK medical school, during which the students are asked to undertake a series of surgical tasks, such as suturing and knot-tying to laparoscopic skills tests with the winner of each heat announced on the night. Billy and the winners from each region along with one lucky randomly selected runner-up across the UK will receive a travel and accommodation package to Edinburgh to stay at the College’s Ten Hill Place Hotel and to participate in the Grand Final. The competition will culminate in Edinburgh on 16 March 2019 at which the top 20 finalists will undertake a broad range of surgical procedures before determining who will be make the cut to become the overall winner presented at the Grand Final. As well as prizes awarded to the winner and runner-up, all participants of the competition will receive a certificate of participation, and gain two years’ affiliation to the RCSEd’s Affiliate Network.